Birthday Newspaper for Any Year. 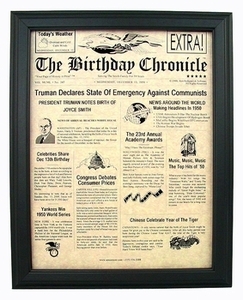 Impress your clients by purchasing a framed birthday newspaper with their birthdate and your personalized message at the bottom. We can create this for any year. Just supply us with the client's birthdate and full name. Contact us for wholesale pricing- we can ship them directly to your company, or we can drop ship them to your customers for you. Put your companies personalized greeting on the bottom of the newspaper. This gift comes in the black frame shown. Contact Us for a price quote.